I had a lot of fun making this colorful Easter Banner!! Lots of great techniques and some awesome products that made this very simple to make. 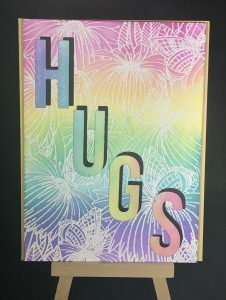 For this project, I used two types of banner dies created by Stephanie Barnard for the Stamps of Life. I used the Rounded Big Banner dies as well as the more traditional Big Banner die set with pointed edges. I also used quilling dies by Sara Davies, owner at Crafter’s Companion for all of the dimensional flowers which were tinted with distress ink. I wanted to make sure I secured all of the banner decorations with strong adhesive so I used a few different products from Xyron Inc. I used the Mega Runner for the bigger items like the eggs and egg layers, and then I used the tape runner for the smaller items and embellishments. The banners were made with a colorful Marble paper pad by Colorbok. I decided to try to replicate Easter egg coloring by using alcohol inks by Tim Holtz and Ranger on yupo paper If you have never tried alcohol inks , I totally recommend it! It is fun and messy and you can make some amazing backgrounds. The dies for the super cute large eggs and the bunny were made with Fold-Its dies by the Stamps of Life – they make really great cards because they are close to A2 in size and they really are a lot of fun to make! The statement dies (Happy and Easter) are also great because they are over-sized and really stand out!! Check them out when you have time. Here are the step by step instructions to make this banner…. I hope you enjoyed this springtime Easter banner project. Please feel free to share your banner projects too! I would love to see them! Happy Easter and Happy Crafting! !